Proud Jews or Law Breakers? A younger generation expresses its Jewishness in a controversial way. Evocative, disrespectful, proud, antithetic: these are just some of the words used to describe Jews with tattoos. Seth Alamar, who has 30-odd tattoos, calls most of his markings religious or “Jewish.” He has heard all the reasons why a Jew should not get tattooed – including the false myth that he would not be buried in a Jewish cemetery. 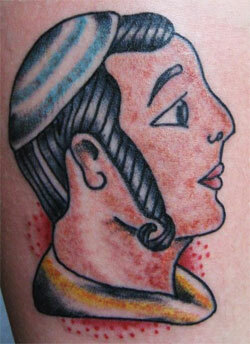 But despite all the controversy surrounding ink in the Jewish faith, he did not think twice. Alamar, who connects especially with his arm piece inscription l’dor v’dor, meaning “From Generation to Generation,” ironically hides his tattoos from his grandparents – the generations before him. While some would see the words as an honor, the older generation of Jews associates tattoos with breaking Jewish law, idolatry, improper burial procedure, and the infliction of tattoos on Jews during the Holocaust. Despite its eerie past, many Jews of the new generation are fighting back with ink, expressing themselves with connection and pride. Expressing a connection to Judaism through tattoos is in fact a hindrance to that very connection, according to Rabbi Lewis, a campus rabbi at Rutgers University. “Personal expressions of spirituality that run counter to Hashem’s [G-d’s] laws are like the husband who constantly gets his wife roses, even though she’s allergic to them. It may make him feel good, but it’s counterproductive to the marriage,” he says. The only students who have a problem with Torah’s laws against tattoos, Rabbi Lewis said, are the ones who already have them. The Torah law stems back to Leviticus 19:28, which states: “You shall not make gashes in your flesh for the dead, or incise any marks on yourselves: I am the Lord.” While this has been interpreted literally to forbid any permanent marking on the body, the larger Judaic concept of b’tzelem Elokim, being created in the image of G-d, serves for a bigger defining question here: What are we allowed or not allowed to do with our own body, the body that G-d gifted us with? Piercings, plastic surgery and other physically permanent alterations on our body are also concerns that fall under this belief in traditional Judaism, though some procedures may balance out differently than others; for example, plastic surgery after an accident is excused. Rabbi Niles Goldstein of The New Shul in New York City says that while the law can be looked at as a literal translation, b’tzelem Elokim is not in itself a justification for staying tattoo-free. Rabbi Goldstein wrote Gonzo Judaism, a book that shakes up the structured way Jews practice, and seeks to find a more engaging, meaningful and edgy take on Jewish ritual and tradition. He admits he thought about getting a tattoo a few times in the past. But because of its history with idolatry, he is now on the side opposing Jews getting tattoos. As Israelites moved among idolatrous nations, Goldstein explained, they were prohibited from following the pagan custom of tattoos that symbolized idolatry. Maimonides, one of the greatest Torah scholars of all time, ties the Leviticus prohibition to this issue but says regardless of intent, the act of tattooing is prohibited. (Mishneh Torah, Laws of Idolatry 12:11) Many Jews – religious or not – still follow this prohibition because it is ingrained in Jewish custom. And although Goldstein says many Jews are getting tattooed as a form of self-expression, not idolatry, if asked, he would still recommend a Jew not get a tattoo because of this history. But now a new generation has started expressing their Jewish identity by turning the law on its head – though not without some reluctance. Tayts finally got her tattoo this year. “It was the only thing I wanted one-hundred percent,” Tayts said, describing the tattoo as one that symbolizes the idea of a circle of life – a concept found in Eastern philosophy and Judaism. “I loved that this idea existed in multiple cultures. And that it was specifically Jewish which is an important part of my identity. I find the symbol to be comforting and meaningful to me on a number of levels,” she said. For Tayts, the tattoo is a reminder to not fear death, and a symbol of her background. Though not everyone expresses Jewishness in the same way, the divide over tattoos as a form of expression still remains passionately split. But as the trend rises, it may not be long before we see tattoos become the norm among Jews, perhaps even in place of a Star of David charm or a yarmulke on one’s head. The fear has come to center not on the tattoo itself, but on a split between old tradition and new. How will the next generation of Jews express their Judaism? What other laws will be altered? The article above was reprinted with permission from BustedHalo.com, and was edited by the 614 staff for length. Read the article in its entirety here. Monica Rozenfeld is a freelance journalist living in Brooklyn, New York. She is fascinated by stories about adversity, culture and religion. Monica is currently earning an MA in health and science reporting, focusing on women’s health matters, both domestic and international. Her new hobby is photography, though she still needs to figure out how her G11 Canon works.